In this Clip Studio brush set are my 9 best digital painting brushes! The set comprises of the RS_Oil, RS_Oil 2, RS_Chalky, RS_Pencil, RS_Oil Flat, RS_Tortillon, RS_Putty, RS_Qwerty and the RS_Airbrush. It has taken me a lot of trial and error to set these brushes up. This is the set I wish I had when I first started digital painting! Each brush shares the same texture, so creating a unified image is no longer a problem. The brushes are designed to act like juicy oil brushes with a little bit of texture and pressure sensitivity. They also take advantage of CSP's amazing blend underlying color. My favorite brush of the set has to the be Tortillon blender brush. 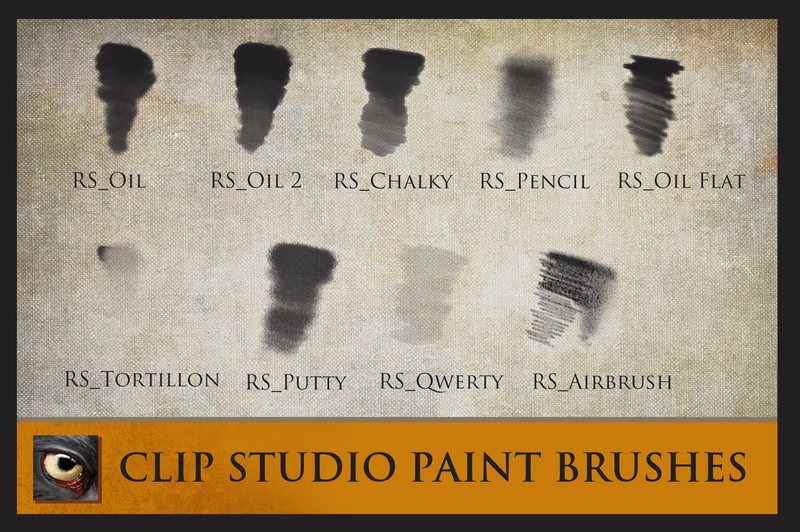 But to be honest, with just a few tweaks of the density, texture scaling and spacing you have an extremely powerful set of universal brushes for all of your painting needs. I truly hope that you get as much fun out of this set as I do.